This is the most comfortable convalescence option ever! It has a motorized lift for getting in and out. 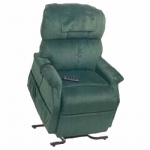 It also reclines to all kinds of angles and is a sleep chair. I am so comfy right now that I can’t believe it. I also rented a table that swings over it. That way I can type on my laptop without putting it on my sore lap. We are also hoping that by keeping the tray positioned over my abdomen that it will dissuade our 15 pound cat from jumping into my lap. And finally, there’s the throne lifter that I got on Amazon. 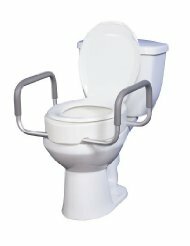 Toilet riser manufactured by Drive. And if all of this doesn’t sound like the utmost in glamor, I am wearing some pretty cute Japanese print pj’s. So glad you are home and comfy! Gotta get me one of those chairs . . . Thanks and yes, you must get one of those chairs. Never ever get rid of any medical equipment that you purchase…you will definitely need it again and probably pay more for it! So glad you are comfy cozy with all these newest pieces of furniture! Sleep well! Yes, I am planning to keep my throne. Everything else is rented. You made some very good choices. I’m glad you’re comfortable. Sleep is so important. Yes and one of our good choices was to buy a house on the same block as Jim and you! Thanks for being such good neighbors. Love it… Go the chair! We got the same chair for my Dad and it was so wonderful! It’s a blessing that these kinds of things are available now. I’m so glad to hear you’re back home. Yep, I highly recommend it. Where do you see my pj’s mom?